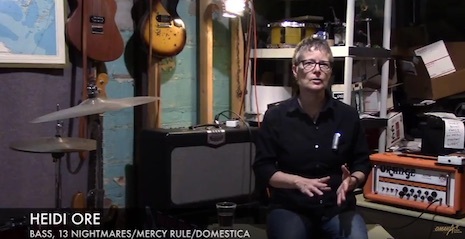 A screen cap of Domestica’s Heidi Ore from the documentary Making Invisible Histories Visible. Among those interviewed for the project were a handful of Nebraska music pioneers: Cami Rawlings Cavanaugh (Lavender Couch), Heidi Ore (Domestica, Mercy Rule), Jamie Pressnall (Park Ave., Tilly and the Wall), Jenn Bernard (Park Ave., Fortnight) and Jessica Mogis (ARC Studio). In addition to discussing the struggles women faced as they made a mark in local music, the video also highlights Omaha’s indie and DIY scenes, including lots of discussion (and photos) of the ol’ Cog Factory and other venues. The final documentary captures an important slice of Nebraska music history. Check out the video and supporting documents here. Tonight at Brothers Lounge Tulsa bands Cucumber and the Sun Tans and The Earslips are joined with Those Far Out Arrows and Jason Steady. No price listed (but it’s probably $5), start time is 9 p.m.